Although George Russell (1923-2009) first emerged on the avant garde jazz scene in 1946, when he wrote for Gillespies Afro-Cuban jazz orchestra, as a composer and musical theorist he stamped his name on jazz history by mapping a new approach without departing from the main jazz route. This he did in his 1953 book, The Lydian Concept of Tonal Organisation, in which he outlined a series of tonal relationships already existing in music, and applied it to his writing. What he specifically wanted to create in jazz was a composition or an arrangement that "will take the listener through a little adventure. "The writing was harmonically adventurous without resorting to complete atonality. It reconciled surprise with structure; true improvisation abounds amid the sense of organized looseness of more conventional jazz groups. Like Duke Ellington, he created a musical climate so pervasive that most of the outstanding players he selected on these recordings subordinated their own musical personalities to his material as they realized the possibilities it created. The overall effect was a continuity of thought few composers or players in jazz have been able to achieve. 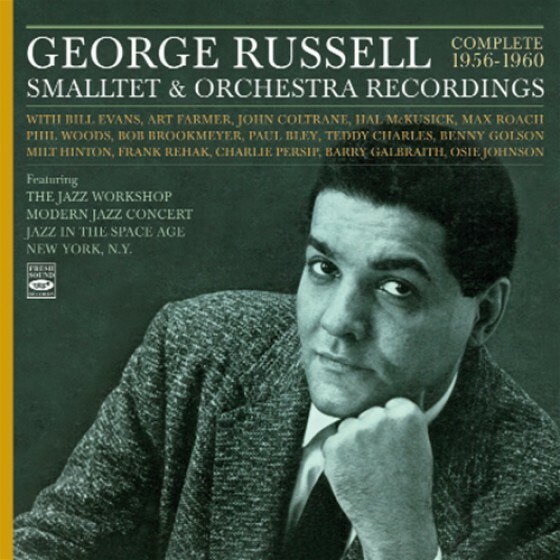 And though Russells music is within the logical growth of jazz, his forms were totally new rather than reconstructions of older forms, because jazz is a new music and must have new forms. Tracks #1-4: Art Farmer, trumpet; Hal McKusick, alto sax; Bill Evans, piano; Barry Galbraith, guitar; Milt Hinton, bass; Joe Harris, drums. Tracks #5-8 & 13: Paul Motian, replaces Joe Harris. Tracks #9-12 & 14: same except Hal McKusick also plays flute; Teddy Kotick, bass and Osie Johnson, drums and on #9 woodblock, replaces Hinton and Motian George Russell, boobams (chromatic drums) added on #9. Tracks #15-17: Art Farmer, Louis Mucci, trumpets; Jimmy Knepper, trombone; Jimmy Buffington, French horn; Robert DiDomenica, flute; John LaPorta, alto sax; Hal McKusick, tenor sax; Manuel Zegler, bassoon; Teddy Charles, vibes; Bill Evans, piano; Barry Galbraith, guitar; Margaret Ross, harp; Joe Benjamin, bass; Teddy Sommer, drums. 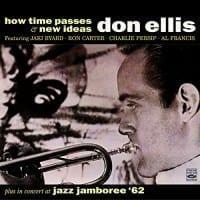 CD 1 - Tracks #18-20: Ernie Royal, Al Kiger, trumpets; Frank Rehak, Dave Baker, trombones; Jimmy Buffington, French horn; Walt Levinsky, alto sax; Dave Young, tenor sax; Sol Schlinger, baritone sax; Bill Evans & Paul Bley, pianos; Barry Galbraith & Howard Collins, guitars; Milt Hinton, bass; Don Lamond, drums; G. Russell, beads on tuned drums. CD 2 - Track #6: Ernie Royal, Al Kiger, trumpets; Frank Rehak, Dave Baker, trombones; Jimmy Buffington, French horn; Walt Levinsky, alto sax; Dave Young, tenor sax; Sol Schlinger, bass sax; Bill Evans and Paul Bley, pianos; Barry Galbraith and Howard Collins, guitars; Milt Hinton, bass; Don Lamond, drums; George Russell, beads on tuned. CD 2 - Tracks #7 & 8: Jimmy Buffington, Paul Bley and Howard Collins out; Marky Markowitz, trumpet; Bob Brookmeyer, valve-trombone, added; Hal McKusick, alto sax, and Charlie Persip, drums replaces Levinsky and Lamond. Personnel on NEW YORK, N.Y.
Track #1: Art Farmer, Doc Severinsen, Ernie Royal, trumpets; Bob Brookmeyer, valve trombone; Frank Rehak, Tom Mitchell, trombones; Hal McKusick, alto sax; John Coltrane, tenor sax; Sol Schlinger, baritone sax; Bill Evans, piano; Barry Galbraith, guitar; Milt Hinton, bass; Charlie Persip, drums; Jon Hendricks, narrator. Tracks #3 & 5: Art Farmer, Ernie Royal, Joe Wilder, trumpets; Bob Brookmeyer, valve trombone; Jimmy Cleveland, Tom Mitchell, trombones; Phil Woods, Hal McKusick, alto sax; Al Cohn, tenor; sax; Gene Allen, baritone sax; Bill Evans, piano; Barry Galbraith, guitar; George Duvivier, bass; Max Roach, drums; Jon Hendricks, narrator. On #3 Don Lamond, drums, replaces Roach; Al Epstein, bongoes, and George Russell, boobams (chromatic drums) added. Tracks #2 & 4: Art Farmer, Joe Wilder, Joe Ferrante, trumpets; Bob Brookmeyer, valve trombone; Frank Rehak, Tom Mitchell, trombones; Phil Woods, alto sax, clarinet; Hal McKusick, alto sax, clarinet, flute; Benny Golson, tenor sax; Sol Schlinger, flute, bassax; Bill Evans, piano; Barry Galbraith, guitar; Milt Hinton, bass; Charlie Persip, drums; Jon Hendricks, narrator. "While he did play the piano, George Russell is best known as a free thinking composer and arranger who changed the direction of jazz by using various unorthodox chordal patterns in his songs, setting the stage for the modal revolution later lead by Miles Davis, John Coltrane and Eric Dolphy. Here, youve got a set that find Russell at his most creative and exciting, with fantastically interesting booklet that include personnel listings, original liner notes, historical background and vintage pictures, so you get an eyeful as well as an earful. 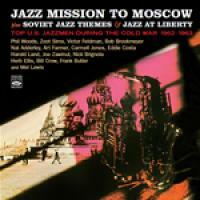 This 2 discs collection includes The Jazz Workshop, Modern Jazz Concert, Jazz in the Space Age and New York, NY. The Workshp includes heavy personel such as Bill Evans/p, Teddy Kotick-Milt Hinton/b, Art Farmer/tp, Paul Motian/dr and Hal McKusick/as and with clever ideas such as Fellow Delegates including Osie Johnson on wood drums and the leader on chromatic ones and hip yet cerebral pieces such as Ezz-thetic. A three part Chromatic Universe sounds quite sterile and foreboding, but with Evans and Paul Bley at the piano and a horn section with Ernie Royal, the sounds are thrilling and the grooves are intact. Most intriguing is the 5 part dedication to New York, with Jon Hendricks delivering some hip narration and John Coltrane sitting in on the reed section for Manhattan and sounding like a team player until he delivers a cooking solo over Hintons bass. Some hot Latin rhythms and horns abound on Manhatta-Rico and a take of Autumn in New York includes velvety reeds by Phil Woods, Al Cohn Benny Golson and McKusick . This music, considered far out for its time, is fresher than 75% of the stale bread we eat nowadays." "This represents the best work in a career which lost its concentration and declined in the later years (Russell died in 2009). The non-conforming composer was restless with, and turned away from developments in modern jazz. While recuperating from tuberculosis, he had devised the The Lydian Chromatic Concept of Tonal Organization (dont ask) and the work on these two CDs is perhaps the finest example of its development. The discipline of the writing puts pressure on the soloists to take advantage of the new opportunities presented to them. It also suggests that they should shed their normal personalities, but usually these come through. There is a new intensity to Farmers playing and the brilliant Bill Evans is pretty voluble. The orchestration of The Lydiot is particularly intriguing, with Evans percussively athletic in his solo and the brass solos (probably Royal, Baker and Rehak) very satisfying. Its not simple music to listen to, and the passing of the years has understandably removed some of its ground-breaking edge. Far from - in fact almost the opposite of - free form, it called for extreme musical agility on the part of its exponents. Evans is the leading player, with notable improvising in his Concerto and the third part of the superb All About Rosie. Brookmeyer, unusually extrovert on the first track of the New York suite, seems completely at home and doesnt respond to any pressure. Evanss solo here is also more typical of him. Coltrane solos on the same track and also proves indefatigable. Benny Golson and Joe Wilder also acquit themselves well in their solos and Persip is very much the right man for the job. Hendricks is another man of infinite talent, but his narration sounds dated and irrelevant. This music is a unique example of disciplined writing (an interesting contrast to Gil Evans!) combined with inspired improvisation. The chunky booklet from Fresh Sound is packed with absorbing information and quite a bit of prose from Russell himself."